On average, a forklift battery will last a single-shift operation five years. Proper care and maintenance can extend battery life up to ten years. Prolong the life of your forklift battery by following these easy Do’s and Don’ts when charging, operating and handling forklift batteries. When your forklift’s battery hits the red zone (only 20% charge remaining) discontinue using that battery right away. Continuing to use a battery past 20% negatively affects its lifespan. Also, deep-discharging can cause electrical components to overheat and damage your lift truck. Battery life can be reduced by as much as 50 percent once the ambient temperature reaches 92 degrees. At the other end of the spectrum, battery performance drops 30 percent when the temperature reaches 30 degrees. If your forklift operates in extreme temperatures, use a battery designed for those conditions. As described above, the ideal time to charge your forklift battery is at 20-30%. Charging a battery with 50-60% left in its charge is like throwing away a sandwich half-eaten. You’ve already “spent” a charging cycle, so use the whole thing. Opportunity charging or quick charging shortens a battery’s lifespan. Think of it like this: a battery is "born" with approximately 1,500 charges in it. The more often it gets charged, the quicker it gets used up. - Charge once a day and the battery should last five years. - Charge twice a day and you can cut that lifespan in half. To get the most out of your forklift battery: always charge your forklift battery completely, and never interrupt a charging cycle. Maintaining a forklift battery is meant to be easy: check the water once a week and clean the top once a month. The hard part? Making sure it gets done. Wear Protective Gear - Batteries contain sulfuric acid, a chemical that can cause severe burns. Follow OSHA recommendations for protective gear and remove all metallic jewellery when handling and charging industrial batteries. Add deionized or distilled water every five to ten charges (check manufacturer recommendations). Add water after charging - never before, and if you notice white crystals on the lead plates, call in a battery engineer immediately. Learn more about why forklift batteries need water. Using battery cleaner or warm water, clean the top of each battery monthly. This is another example of easy, but often neglected maintenance. Chemical build-up can lead to tray corrosion and may void the manufacturer’s warranty. Forklift batteries are very heavy! No single person or team of people should attempt to lift a forklift battery. Use equipment such as a pallet truck equipped with a transfer carriage. If a battery begins smoking, power it off immediately. Do not use this battery again. Though electric forklifts cost more versus gas/ICE forklifts in the beginning, they have a lower cost of ownership in the long run. Ensure your operation gets the maximum value from their electric lift truck through proper battery maintenance and charging. Do you need to replace or service your fleets batteries? To keep your business operations up and running, you need fast access to the highest grade of industrial, traction batteries. 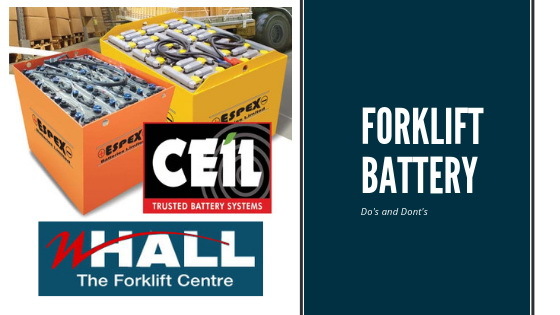 W Hall – The Forklift Centre supply fit and service the Espex range of traction batteries sourced directly from Exide Industries Limited in India. 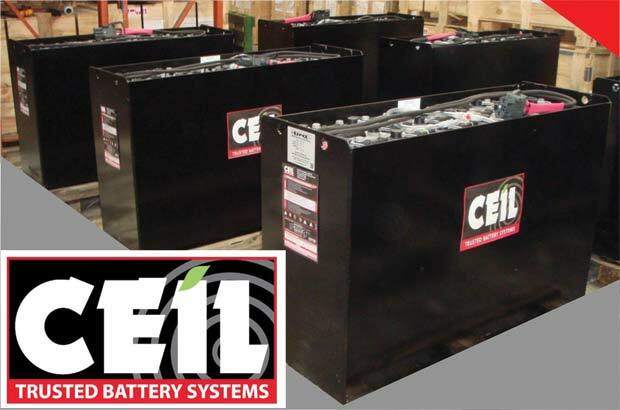 ‘CEIL Trusted Battery Systems’ are available from W Hall across Ireland. We offer sales, service, cell replacement and disposal of industrial batteries together with high quality chargers.